Look back 30 years. What did it cost to purchase a car? Eggs? Electricity? Blue jeans? A house? Certainly less than today. Most of us know instinctively that prices will likely be quite a bit higher 30 years in the future. For example, although Americans are currently enjoying a reprieve in the cost of a gallon of gas, we would be fooling ourselves to believe the price will never again rise above two dollars. State government services and programs are no different. Over time, state spending goes up. That’s normal. Inflation pushes routine expenses higher. Populations grow, requiring more services. Greater numbers of students show up at school. The ever-rising price of healthcare drives a steady increase in Medicaid costs. The National Association of State Budget Officers tracks spending across all states. Over the past 30 years, the average 50-state general fund spending increase has been right at five percent a year. How does Kansas compare to the rest? A little below the average. The “normal” budget increase for Kansas over that 30-year period has been 4.85 percent. Recently, in the wake of the Great Recession, spending by states has moderated somewhat — 4 percent annual average growth nationally in the last four years, 3.3 percent in Kansas. While spending patterns in Kansas have been mainstream, Kansas has deviated sharply from the norm on revenue collections. 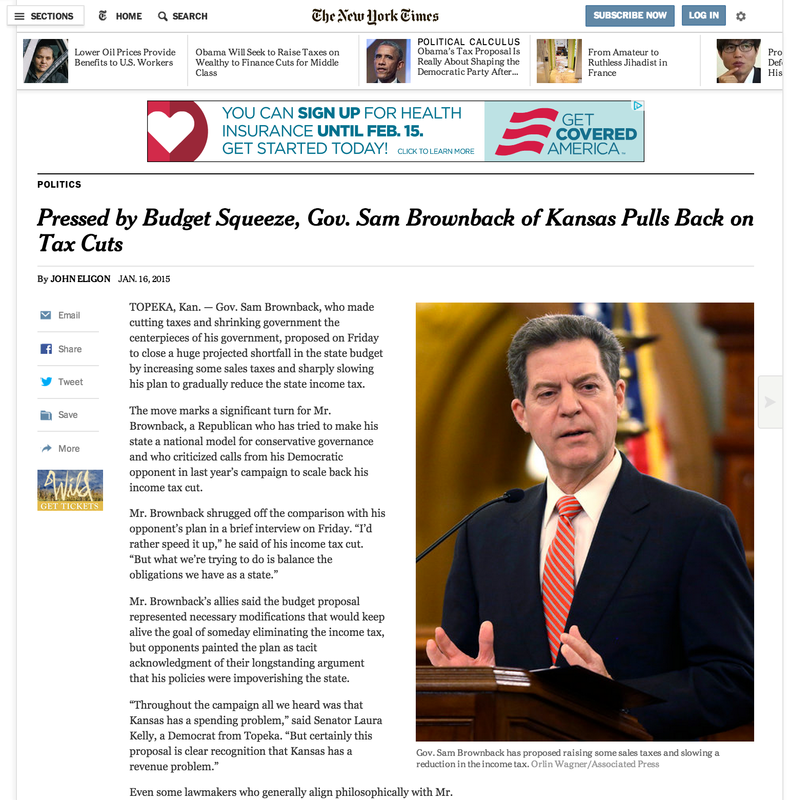 Last year, Kansas income tax collections dropped 25 percent as a result of the Brownback tax policy. No other state experienced anything like that. In most states, revenue collections grew. That’s normal. But Kansas revenue fell dramatically. Kansas has been left with a financial predicament in which general fund expenses are about $6.4 billion and rising, while revenue has fallen below $5.8 billion. With even more income tax rate reductions scheduled to kick in, it’s unlikely that revenue will grow much. That situation cannot go on for long. So far, lawmakers have bridged the difference by spending down the general fund bank balance, but now, those funds have been depleted. Most states have a “rainy day fund” from which to draw in emergencies, but not Kansas. The time of hard decisions has arrived. Some legislators will attempt to cut spending to fit the emaciated revenue stream. But resetting expenses to some lower level carries very real consequences. Kansas courts have ruled that schools already receive unconstitutionally inadequate funding. Further cuts will hurt classrooms and kids. Reducing stretched human service programs affects the most vulnerable Kansans. Less highway maintenance means more potholes. Alternatively, lawmakers could choose to address the root of the budget problem. Revenue has been set unrealistically low. Lawmakers have failed to provide enough income to cover regular expenses, let alone pay to bring school funding back up to an adequate level. Options to correct this include stopping the next round of tax cuts, adjusting the business tax exemption, and rethinking income tax rates. What will it be? Will the decision-makers put all their time and energy into downsizing schools, highway maintenance, and public safety programs, or will they make a realistic assessment of what it costs to pay for key services and figure out a fair way to fund that? The Kansas legislative session has begun. Our lawmakers are choosing for us now. Watch out! 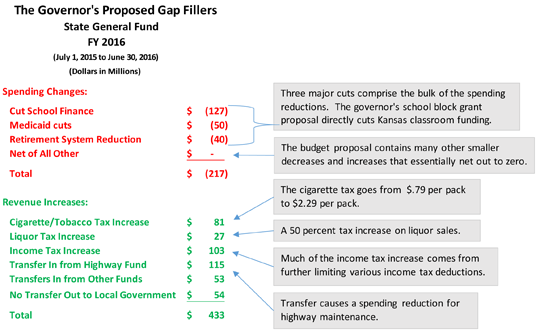 Even though the governor has proposed a way for Kansas to financially stumble through fiscal year 2015, most of his recommendations require legislative approval to become effective. With the legislative session just beginning, anything could happen. Schools, human service programs, and other key state services are still very vulnerable to more cuts in the last half of this fiscal year. The FY 2015 state budget is badly out of balance. 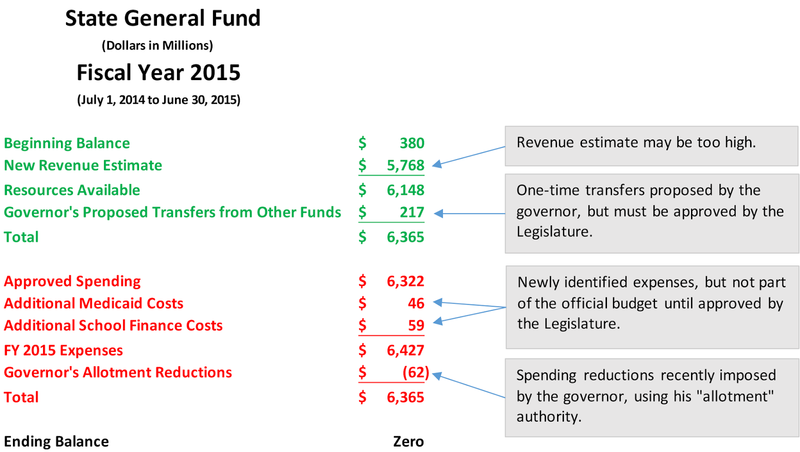 General fund expenses total over $6.4 billion, but estimated revenue is less than $5.8 billion. A portion of the $650 million-plus gap will be bridged by using up $380 million that was in the bank at the beginning of the fiscal year. The governor has proposed transferring $217 million from other funds, most notably the Highway Fund. However, the governor does not have the power to do that without agreement from the Legislature. Moving the money creates new problems in the other funds, so lawmakers may not agree. If that happens, then something else — likely bigger spending cuts — would be imposed. With the dire financial situation that Kansas now faces, the governor does have “allotment” power, which allows him to unilaterally cut the approved budget. 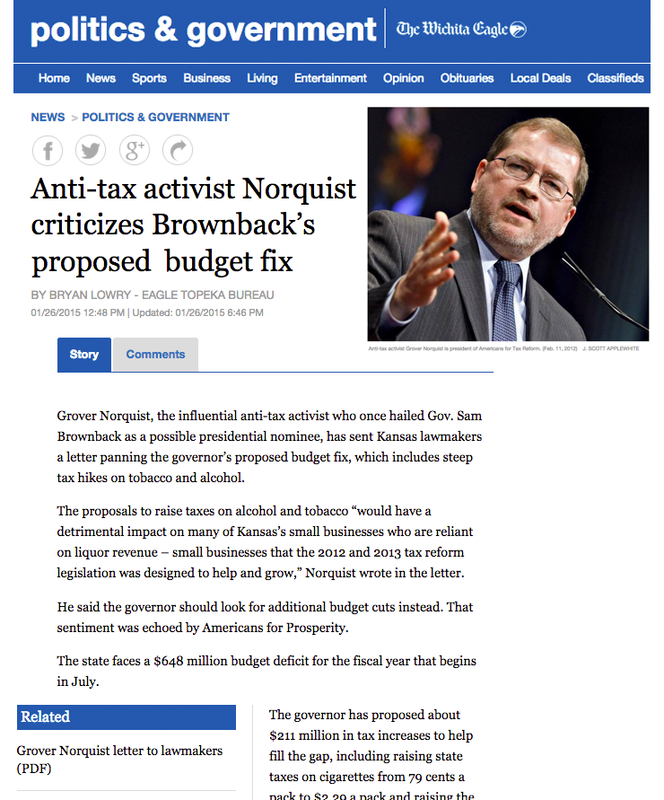 He did that in December, but cut only $62 million, mostly by reducing the amount going into the Kansas Public Employees Retirement System (KPERS). He should not have cut KPERS funding. The cut breaks a state commitment and is unprecedented. Even Republican lawmakers have criticized the move, and may try to undo it. But, with the state in such a bad financial position, undoing the KPERS cut requires lawmakers to cut something else instead. State officials determined in November that Kansas will have additional costs in this fiscal year for Medicaid ($46 million) and school finance ($59 million). However, those expenses are not yet part of the approved budget. Lawmakers must take action to put the funding in. If they don’t, it’s a cut to Medicaid and schools. Even though the FY 2015 revenue estimate was revised downward one week after the election, it may still be too high. The forecast predicts that FY 2015 revenue will grow $115 million from the amount received in FY 2014. However, after six months, FY 2015 revenue is $40 million behind last year’s pace. 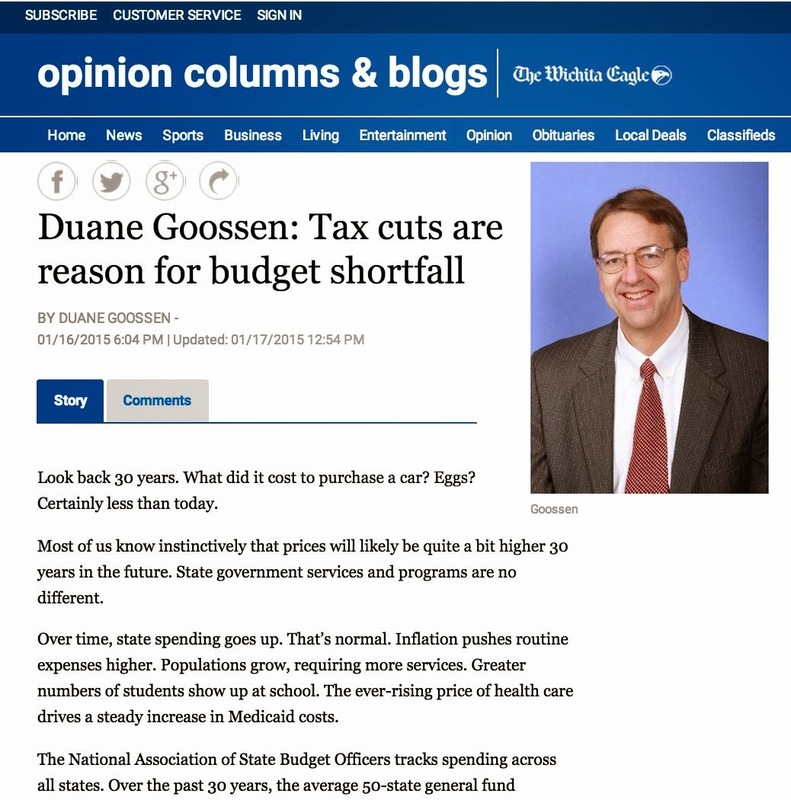 If revenue does not meet projections, lawmakers will need to make last-minute cuts. Hopefully, lawmakers will settle the FY 2015 issues quickly before creating new budgets for FY 2016 and FY 2017. If they don’t, uncertainty about possible cuts late in the fiscal year will hang over state programs and schools. Plus, it’s important to know the starting point for the next budget. Most likely the starting point for FY 2016 will be zero money in the bank. The revenue forecast for FY 2016 totals $5.8 billion. Realistic expenses for FY 2015 are already more than $6.4 billion. In FY 2016 they will be higher. The 2015 legislative session promises to be very difficult.